PEB4000 is a complete and plug and play High PoE solution, offering up to 30 watts of output power and an ideal solution for high power equipment manufacturers and system integrators of Pan-Tilt-Zoom (PTZ) video surveillance cameras, 802.11n and Bluetooth® access points, internet time clocks, WiMax®, RFID, thin client, point of sale, advertising displays, industrial sensors, and single board computer, systems. It has full functional compliance with the IEEE 802.3af and Layer 1 classification of the IEEE 803.2at, Power over Ethernet (PoE) standard. It is designed to extract power from CAT5 and better Ethernet cable when sourced by a IEEE 802.3af or IEEE 802.3at compliant Power Sourcing Equipment (PSE) midspans or endspans. 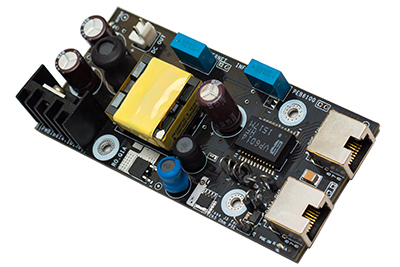 The PEB4000 offers high efficiency from 5W to 30W, and is ideal for use across the load band. The PEB4000 is tested for EMI compliance to FCC Class B Part 15 and EMI/EMC as per CE mark. It also offers 1500Vdc isolation between input and output, and it’s output can be permanently short circuited without damage. PEB4500 is a complete and plug and play High PoE PD solution, offering up to 45 Watt peak and 40 Watt RMS of output power and an ideal solution for high power equipment manufacturers and system integrators of Pan-Tilt-Zoom (PTZ) video surveillance cameras, 802.11n and Bluetooth® access points, internet time clocks, WiMax®, RFID, thin client, point of sale, advertising displays, industrial sensors, and single board computer systems. PEB4500 series is designed to extract power from CAT5e and better Ethernet cable when sourced by a IEEE 802.3af or IEEE 802.3at compliant Power Sourcing Equipment (PSE) midspans or endspans. PEB4500 supports the different power injection options of 4 - Pair or Data/Signal Pair. It is compatible with both standard (24.9KOhm) and non-standard (12.5KOhm) signature detection PSE’s. 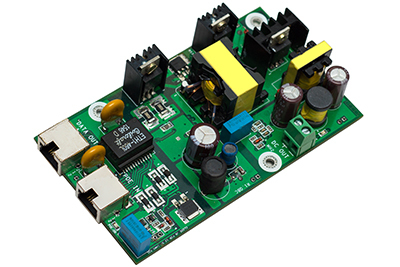 The PEB4500 offers high efficiency from 5W to 40W, and is ideal for use across the load band. PEB4500 has got variants with choices in input and output connectors, offering flexibility in interfacing with target devices. PEB4500 offers 1500Vdc isolation between input and output, and it’s output can be permanently short circuited without damage. PEB6100 is a complete and plug and play Ultra High PoE PD solution, offering up to 57 Watt RMS of output power and an ideal solution for high power equipment manufacturers and system integrators of Thin clients, signage and advertising displays, Pan-Tilt-Zoom (PTZ) video surveillance cameras, 802.11n and Bluetooth® access points, internet time clocks, WiMax®, RFID, point of sale, industrial sensors, and single board computer systems. PEB6100 series is designed to extract power from CAT5e and better Ethernet cable when sourced by a IEEE 802.3af or IEEE 802.3at compliant Power Sourcing Equipment (PSE) midspans or endspans. PEB6100 supports the different power injection options of 4 - Pair or Data/Signal Pair. It is compatible with both standard (24.9KOhm) and non-standard (12.5KOhm) signature detection PSE’s. The PEB6100 offers high efficiency from 10W to 57W, and is ideal for use across the load band. PEB6100 has got variants with choices in input and output connectors, offering flexibility in interfacing with target devices. It provides a well-regulated low noise and low ripple output with inbuilt in-rush current, overload and output short-circuit protections. PEB6100 offers 1500Vdc isolation between input and output, and it’s output can be permanently short circuited without damage. PEB9500 is a complete and plug and play Mega PoE PD solution, offering up to 82 Watt RMS of output power and an ideal solution for high power equipment manufacturers and system integrators of Thin clients, signage and advertising displays and single board computers, and digital ceiling. It can also be used as POE solution for Pan-Tilt-Zoom (PTZ) video surveillance cameras, 802.11n and Bluetooth® access points, internet time clocks, WiMax®, RFID, point of sale, industrial sensors etc. PEB9500 series is designed to extract power from CAT5e and better Ethernet cable when sourced by a IEEE 802.3af or IEEE 802.3at compliant Power Sourcing Equipment (PSE) midspans or endspans. PEB9500 is primarily meant for 4-pair POE injection, but it also works with either data or spare pair power input. It is compatible with both standard (24.9KOhm) and non-standard (12.5KOhm) signature detection PSE’s. PEB9500 is the ideal POE PD solution to take the full 95Watt power output from the Mega POE and Power Over HDBaseT (PoH). 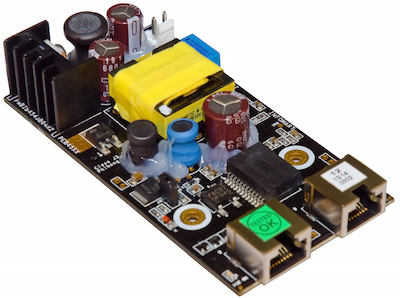 The PEB9500 offers high efficiency from 15W to 82W, and is ideal for use across the load band. PEB9500 has got variants with choices in input and output connectors, offering flexibility in interfacing with target devices. It provides a well-regulated low noise and low ripple output with inbuilt in-rush current, overload and output short-circuit protections. PEB9500 offers 1500Vdc isolation between input and output, and it’s output can be permanently short circuited without damage.